Simulated Horizons is formed by a series of photographs of the sea and another series of photographs of the sky. In the set of photographs of the upper line, all of the photos of the sea are identical, while the photos of the sky vary. In another set of photos aligned side-by-side, all photographs of the sky are identical, while those of the sea vary. 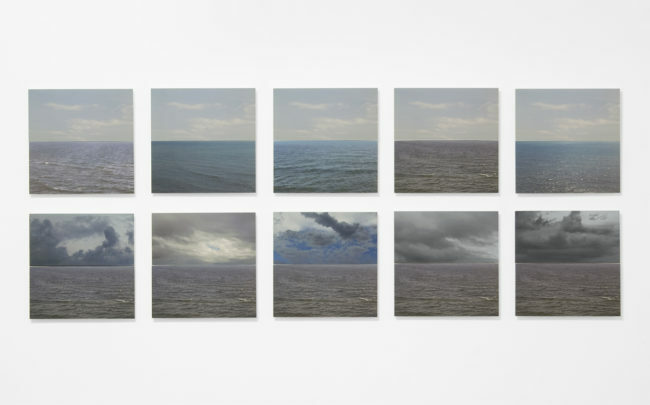 They are possible combinations de images of sky and sea, which together form possible horizons (or simulated horizons). The horizon line is formed by the meeting between photos of the sky and photos of the sea. “Simulated Horizons” photographed by Juliana Lima in the exhibition Convivência Espacial (Galeria ECARTA, 2010).